BECKHOFF Automation presents the XFC (eXtreme Fast Control) technology suitable for process optimisation in injection moulding machines. The XFC PC-based control system from Beckhoff opens up a new performance dimension in control technology. Extremely precise timing facilitates process measurement with a temporal resolution of 10 ns. The reaction time of less than 200 μs leads to higher productivity and improved reproducibility due to short cycle times. This allows the plastics processor to save on material by decreasing the size of the process window. Part weight fluctuations are minimised further in servo-electric machines. Efficient, resource-saving production requires fast control technology and the use of servo-electric drives. While hydraulic drive concepts are common in plastics machines, energy-efficient injection moulding and blow-molding machines are increasingly being equipped with servomotor-driven hydraulic pumps or electric drive axes instead. Beckhoff offers highly dynamic servo drives for incorporation in the XFC control technology for more efficient production. 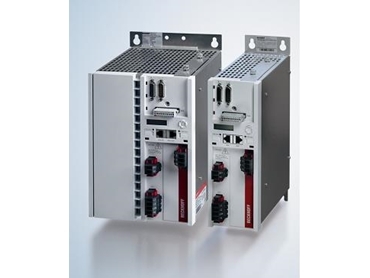 AX5000 series servo drives are integrated into the PC-based control system via EtherCAT. One area of application, for example is the fast, impulse-free switching to holding pressure, which significantly influences product quality. The highly dynamic signal from the pressure sensor is detected in the Beckhoff EtherCAT I/O system via an XFC terminal. The pressure curve can be determined exactly with the aid of this oversampling technology. In combination with the time-stamp function, reproducibility is increased drastically in comparison with classic solutions. The injection process can be adjusted more precisely with part weight fluctuations minimised. The control algorithms are processed in the central PC controller by means of the TwinCAT automation software. Since special firmware is not required in the servo drive, machine manufacturers can integrate their own know-how, allowing changes to be made centrally.